While I was browsing YouTube for something to watch, I started finding lots of full Asian horror movies with English subtitles and decided to make a playlist out of them. Even though every Asian horror movie that I've ever watched seems to be exactly the same with long-haired ghosts and schoolgirls in uniform, I've still watched quite a few of them either on YouTube or Netflix when I had it. 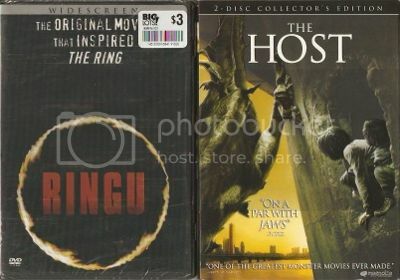 I still don't own any Asian horror movies on DVD apart from "Ringu" (1998) and "The Host" (2006). I've never even opened "Ringu" and you can see that it's still shrink-wrapped. I know it's a bit crass but I actually prefer the American remakes. 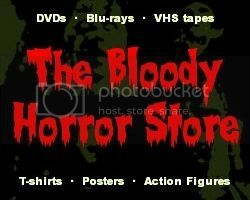 I also have "The Vengeance Trilogy" but I don't count any of those as horror. If I was to start collecting them, I'd probably also buy "Dear Friend" (2004) which is much the same as "Forget Me Not" (2009), the original version of "Shutter" (2004), "Dream Home" (2010), and, of course, "The Cat" (2011). Anyway, if you like Asian horror then you might find something new to enjoy on my playlist. If you have any other recommendations for me, please leave them as a comment below.